Tiesj Benoot had to give up on Sunday in Paris-Roubaix after a hard collision with a team leader's car from Jumbo-Visma. The Belgian has a broken collarbone and many bruises, but also knows that it could have ended a lot more seriously. "I realize that I have escaped much worse. I am breaking my neck for the same money," said 25-year-old Benoot against Het Nieuwsblad . 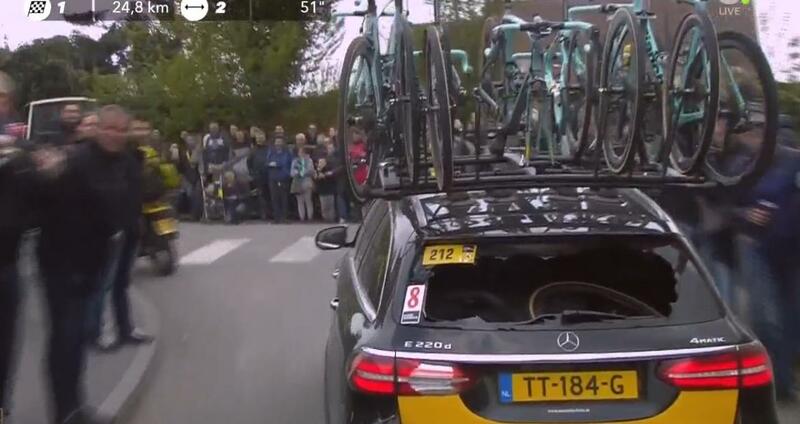 The leader of Lotto Soudal did not know a happy edition of Paris-Roubaix due to a flat tire and a fall when he popped in the chase on the peloton full on the back of the Jumbo-Visma car. "At a certain moment the Jumbo-Visma car was in front of me and suddenly he closed everything. I could not respond anymore and I flew full to the trunk. The reverse shattered completely," Benoot said. "A motorcyclist behind me also crashed because he tried to give way to me and then fell against me. When I was on the ground, I was in great pain everywhere." "Team leader does not do it on purpose"
Benoot had to be transported by ambulance to the hospital of Valenciennes. It turned out that he has a fracture in his right collarbone. On Monday, further investigation will show whether there is also a muscle tear around the pelvis or in the upper leg. The spring of last year's winner of Strade Bianche is over anyway. The Flemish does not want to blame anyone for the collision. "I don't blame anyone. The team leader doesn't do that on purpose. It's Roubaix's stress." Lotto Soudal team leader Herman Frison agreed with those words. "Nico Verhoeven (team leader at Jumbo-Visma, ed.) Stopped immediately to apologize and ask how things were with Tiesj." "You don't do that on purpose and you don't wish your worst enemy. It is a sad accident. In Paris-Roubaix it is so hectic, you constantly have to look left and right. Nico couldn't go his way and in a fraction he braked for a second. " The Belgian Philippe Gilbert won the 117th edition of Paris-Roubaix. Jens Keukeleire was in 29th place the best rider of Lotto Soudal. @marianoryan @mario_sabato Tiejs Benoot chocó contra el car de Jumbo Visma y tuvo que abandonar, al parecer está and el hospital pasando unas pruebas médicas, al parecer nada grave. Así está el coche del Jumbo, parece que producto del golpe.